A Fulmination on Contemporary Politics. USS Constitution vs H.M.S. 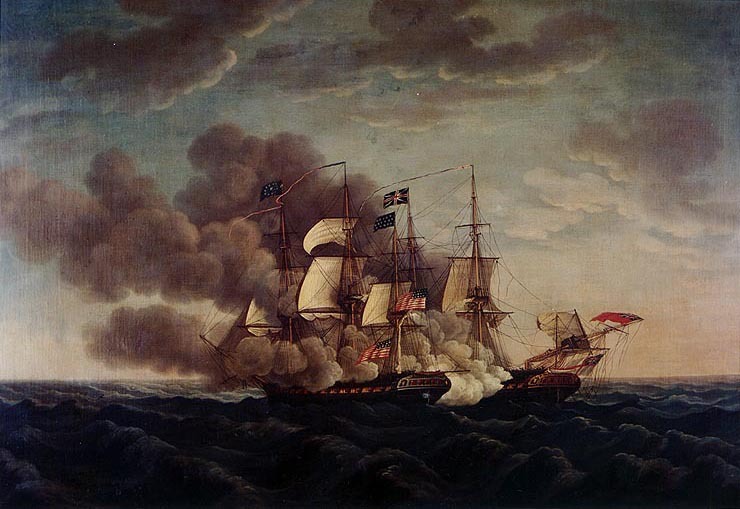 Guerriere, 19 August, 1812 . In his book 1984 George Orwell presciently described constant warfare as a way of maintaining control over people by diverting attention from the true machinations of their masters. Our world has realized Orwell’s fantasy. There are wars or armed conflict in or between Libya, Egypt, Palestine, Israel, Yemen, Syria, Afghanistan and Pakistan. Now we can add to Orwell’s formula the mind numbing babble of incessant electioneering and its constant stream of bilge water from empty headed politicians and their equally empty headed script writers. Coupled with war, a true double whammy. During 2011-12, a record number of Republican party candidate debates were held. I’ve listened to a few of them and though I can’t imagine any of the participants as President of those United States, I have been amused by their attempts to drape themselves with the mantle of Conservative while denying it to their opponents. As the debates glacially wind their way, what I have long known has been reaffirmed, conservative has no meaning in politics and its usurpation by politicians has deprived the English language of an otherwise useful adjective. While the candidate’s monotone romp through the states continues, their media expendatures soar. Predictions on total spending by both parties during the 2011-12 campaign including the presidential run off range from $2.6 to $2.8 billion. So far, the republicans have spent about 40 million dollars on advertisements either promoting themselves or demoting their opponents. And the presidential election is yet to come.[2.] The candidates who complained about being outspent were considered whiners, a good old American pejorative which used to mean, “If you can’t stand the heat, get out of the kitchen”, but now means, “If you don’t have the money, forget public service”. Perhaps it is my age. However these past months have been filled with such inanity, hubris, ignorance, vindictiveness and exorbitant expenditures of money as to almost completely flummoxed my attempts to understand what has happened to the great Republic that was the United States of America just a couple of decades ago. These men demonstrate neither the intelligence nor creativity to confirm or guide the ideals of our Republic, they only want to be its president. Why are these Peck-sniffs, as H.L. Mencken might have called them, not speaking about the Gulf coast and the city of New Orleans, the hurricane, tornado and flood riven towns, the crumbling roads, buildings and schools, the millions of non-working poor and semi-employed, the national parks . . . I have to stop. I’m not angry, but I am sad. The US of A is now a third world country and the haves seem content for it to be. Now even John Wayne couldn’t help. [1.] By law Canadian elections must last a minimum of three months, but traditionally lasts no longer. The longest in history was 74 weeks in 1926. [2.] To date, Obama has a $140,000,000 + “war chest” for the run against his expected Republican opponent Romney, whose stash is in the neighborhood of $57,000,000. [3.] Clinton (President, 1993-2001) rescinded the Glass-Steagall Actt or Banking Act of 1933 which provided for the safer and more effective use of the assets of banks, regulated interbank control, prevented the undue diversion of funds into speculative operations, and for other purposes. Thank you, Robin. Wonderful, beautifully written……as usual.